If we weren’t such devoted and devout followers of Canadian Prime Minister Stephen Harper and his beloved Conservative government, we might have to admit that not only is he depressingly anti-democratic, and a fetishist or fascist about terror and crime, but a dolt without a drop of cultural taste. His aesthetic appreciation seldom rises above the level of a family Selfie. Having slashed cultural and communications budgets over his decade (it feels like a century) in office, when he does make an artsy proposal, it turns out to be “offensively tasteless,” “Stalinist” and the mother of all ugliness. We’re referring, of course, to the proposed Mother Canada 10-storey-high statue slated to be placed on the shore of Cape Breton Highlands National Park in Nova Scotia. 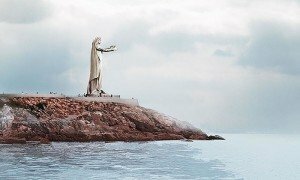 The cloaked and nun-like female figure with its arms stretched out towards the Atlantic Ocean is meant to honour Canada’s soldiers who died overseas. A Globe and Mail editorial said the giant statue was “a hubristically arrogant act of unoriginality. The bigger is better approach is best left to Stalinist tyrants, theme park entrepreneurs, and insecure municipalities hoping to waylay bored drive-by tourists.” The latest argument against the scheme, reported in the Sydney, Nova Scotia Cape Breton Post (July 9, 2015), is that the Green Cove location is a significant Mi’Kmaq aboriginal cultural and spiritual site. 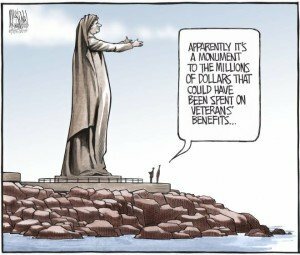 Even cartoonists have been lampooning Mother Canada. Cartoonist Bruce MacKinnon weighs in. 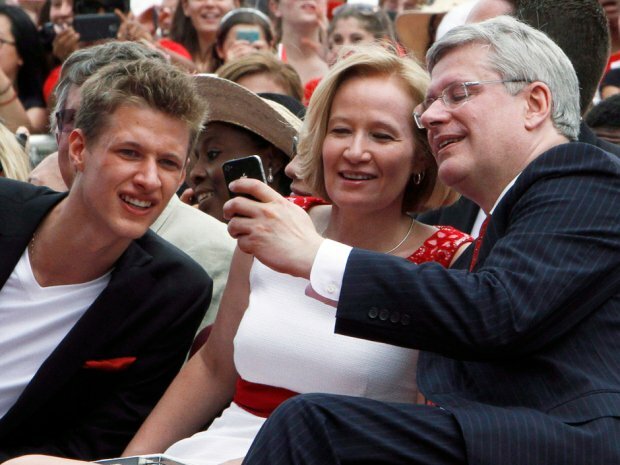 Gee, maybe beauty isn’t in the eye of the political beholder.